Instructions: Card base is 6x6". Cut a 6x6" dark green panel from the paper collection then a yellow 5.75 x 5.75" panel and ink the edges with Wild Honey distress ink. 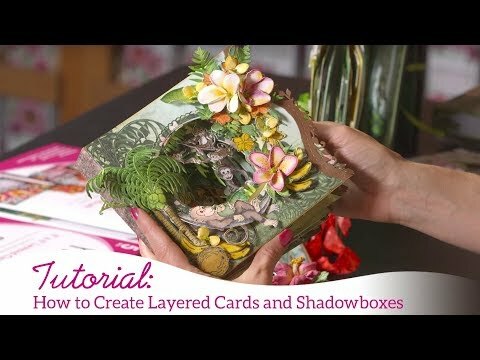 Assemble the box cutting a frame using the cut mat create die as well as a 5x5" scenery piece for the inside. I also cut strips to go on the sides for the shadow box card too. Cut and Stamp on white card using coffee archival ink 2 sets of classic sunflower; the coneflower images and the Gardens edge wheat and sunflower edge. Also stamp the leaves form the delightful daisy as well as a classic rose vine. Color all your images using the archival inks on the leaves and the distress inks on the flowers. Create the cone flower by cutting a sunflower in half; and placing dries clear on the cut edge then gluing it down on the stamped image. Add some seed beads to the centers of the sunflowers as well as the small sunflower spray for the inside of the card. Place the wheat and the smaller sunflower edge inside the base of the shadow card. Die cut the doily from the Butterfly Kisses and cut this in half, I placed this in the front on the back of the bottom frame of the card just to add some detail. Place the curved coneflower on the righthand side and the straight coneflower on the left. Detail all the flowers and leaves with Crystal clear. Look for a sentiment from the collection. I used Celebrate today and popped this on the front near the bottom of the shadow box. I decided to add some depth to the box by inking the outside edges with wild honey distress ink.